In case you missed the exciting update last week, the PowerCLI Core Docker Container is now hosted on Docker Hub. 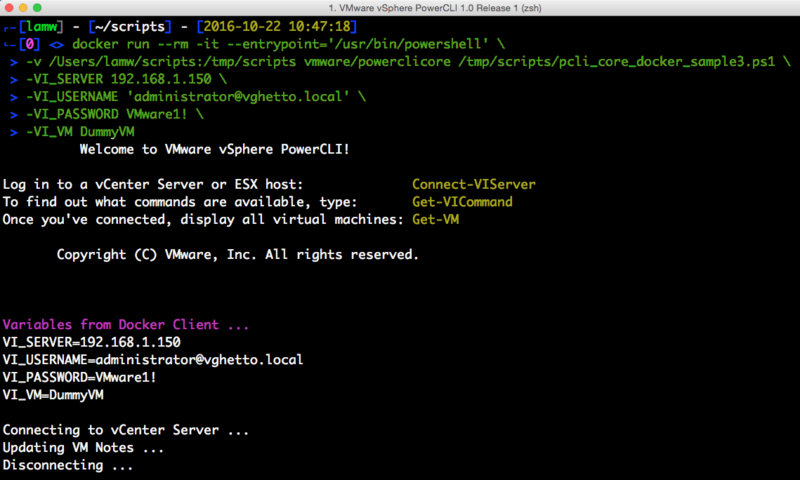 With just two simple commands you can now quickly spin up a PowerCLI environment in under a minute! This is really useful if you need perform a couple of operations using the cmdlets interactively and then discarding the environment once you are done. If you want to do something more advanced like run an existing PowerCLI script as well as potentially persist its output (Docker Containers are stateless by default), then there are few options to consider. To better describe the options, lets use the following scenario. Say you have a Docker Host, this can be a VMware's Photon OS or a Microsoft Windows, Linux or Mac OS X system which has the Docker Client running. The Docker Host is where you will run the PowerCLI Core Docker Container and it also has access to a collection of PowerCLI scripts that you have created or downloaded else where. Lets say the location of these PowerCLI scripts are located in /Users/lamw/scripts and you would like them to be available within the PowerCLI Core Docker Container when it is launched, say under /tmp/scripts. Here is a quick diagram illustrating the scenario we had just discussed. Note: Before getting started, please familiarize yourself with launching the PowerCLI Core Docker Container which you can read more about here. In addition, you will need access to either a vCenter Server or ESXi host environment and also please create a tiny "Dummy" VM called DummyVM which we will be using to update its Notes field with the current time. This is the most basic and easiest method. You literally run a PowerCLI script that already contains all of the necessary information hardcoded within the script itself. This means things like credentials as well as user input that is required can be found within the script. This is obviously simple but makes it very inflexible as you would need to edit the script before launching the container. Another downside is that you now have your vSphere credentials hardcoded inside of the script which is also not ideal from a security standpoint. If executed correctly, the Docker container should launch, connect to your vSphere environment, update the notes field of DummyVM with the current time and then exit. Pretty straight forward and below is a screenshot of this example. Nobody likes hardcoding values, especially when it comes to endpoints and credentials. This next method will allow us to pass in variables from the Docker command-line and make them available to the PowerCLI scripts inside of the container as OS environmental variables. This allows for greater flexibility then the previous option but the downside is that you may potentially be exposing credentials in plaintext which can be inspected by others who can perform docker run/inspect commands. You also need to update your existing PowerCLI scripts to handle the environmental variable translation which may not be ideal if you have a lot of pre-existing scripts. If executed correctly, you will see that the variables that we have defined are passed into the container and we are now able to make use of them within the PowerCLI script by simply accessing the respective environmental variable names as shown in the screenshot below. If you have created some PowerCLI scripts which already prompt for user input which can include also include credentials, then another way to run those script is to do so interactively. If the parameters are required for a given script, then it should prompt for input. The benefit here is that you can reuse your existing PowerCLI scripts without needing to make any modifications even when executing it within a Docker container. You are also not exposing any credentials in plaintext. To take this step further, you could also implement the secure string feature in PowerShell but that would still require you to include a small snippet in your PowerCLI script to do the appropriate decoding when connecting. If executed correctly, you will be prompted for the expected user inputs to the script and then it will perform the operation as shown in the screenshot below. Similiar to Option 3, if you have defined parameters to your PowerCLI script, you can also just specify them directly in the Docker command-line just like you would if you were to manually run the PowerCLI script in a Windows environment. 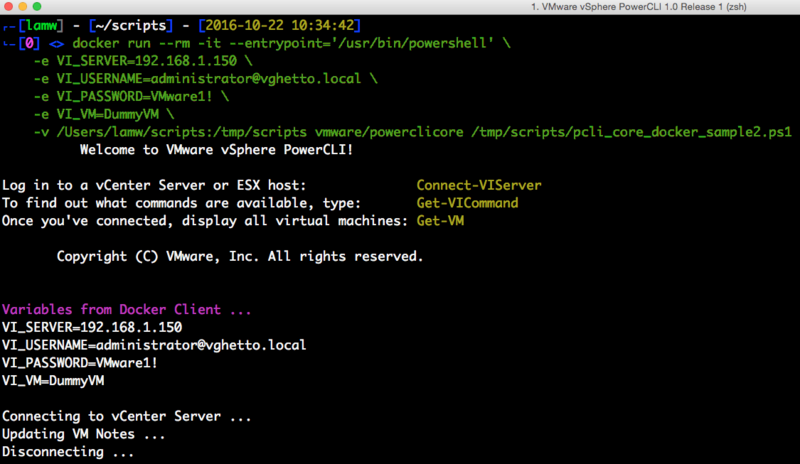 Again, the benefit here is that you can reuse your existing PowerCLI scripts without any modifications. You do risk exposing any credentials if you are passing it through the command-line, but the risk was known as you are already doing that with your existing scripts. A downside to this option is if your PowerCLI script accepts quite a few parameters, your Docker run command can get quite long. You may just consider prompting for endpoint/credentials and the rest of the user input can then be passed in dynamically if you were to go with this option. Note: Some of you might be thinking about PowerCLI's credential store and seeing how that might be a better solution but currently today that has not been implemented yet in PowerCLI Core which is really leveraging Microsoft's credential store feature. Once that has been implemented in .NET Core, I am sure the PowerCLI team can then add that capability which is probably the recommended and preferred option both from a security perspective as well as Automation standpoint. If executed correctly, the same variables in the credentials file will then be loaded into the PowerCLI script context and run the associated operations and exit. As you can see, there are many different ways in which you can run your existing PowerCLI scripts using the new PowerCLI Core Docker Container. Hopefully this article gives you a good summary along with some real world examples to consider. Given this is still an active area of development by the PowerCLI team, if you have any feedback or suggestions, please do leave a comment. I know the Alan (PM) as well as the engineers are very interested in hearing your feedback and seeing how else we could better improve the user experience of both PowerCLI Core as well as consuming PowerCLI Core through these various interfaces. 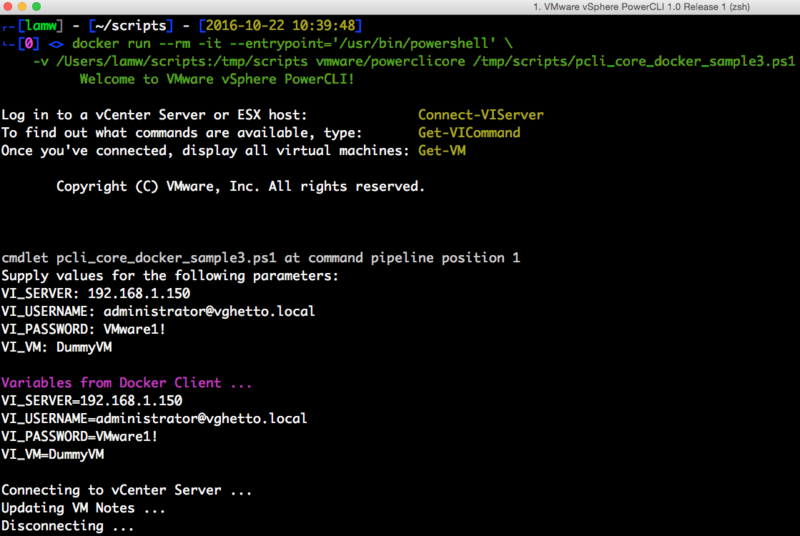 PowerCLI Core is now available on Docker Hub! if i launch the powercli container and then call the mounted script it works fine. I’ve been trying to find an answer with no luck, any help would be greatly appreciated. Figured it out. In case anyone else has the same problem I had to add the –entrypoint and my powershell script had to be in lowercase. Hi, wondering if you know how to control the permissions of files created from within the powercli docker? Im using this to backup the host firmware however the files are all been saved as root.